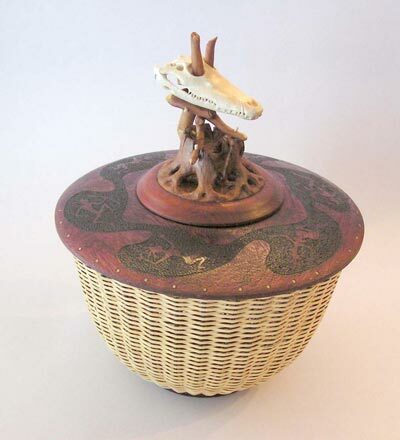 We haven’t made one of these little art baskets in a while, but recently I was reminded of this one, and decided it would be nice to put it up here. Hope you find it interesting! Here’s a little teaser to get things rolling. Roughly shaped naturally-shed moose antler, about 3 inches (7.5 cm). Stay tuned for developments. A little more refinement, and beginning to locate the eyes. Here’s where I’m going, with this part at least. It’s going to be part of a larger work. The smaller image is my pattern, and the larger my references, pulled from various places on the Internet. 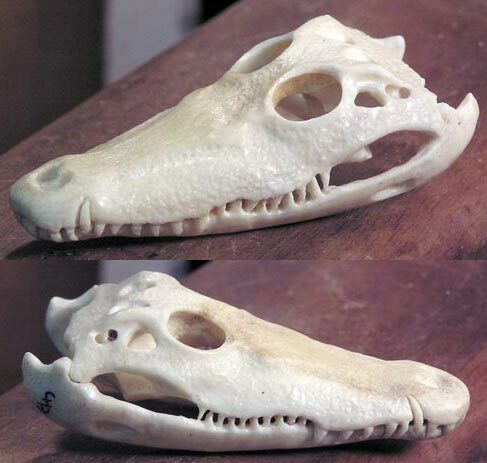 Here’s the skull with the eyes roughly located, and the major features drawn in. Working forward along the jaw to where the teeth start. Beginning to hollow out behind the eye sockets, and hollowing out underneath. The jaw openings are going in as well as the nostrils. 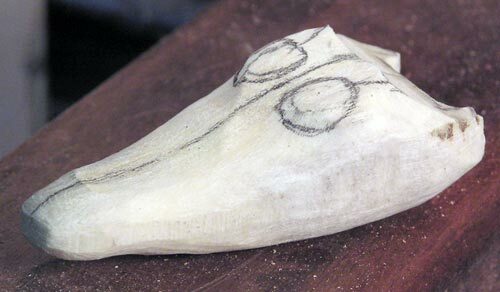 More hollowing, and establishing the mouth line. Starting on the teeth (the big front ones). Now starting the back ones (smaller). 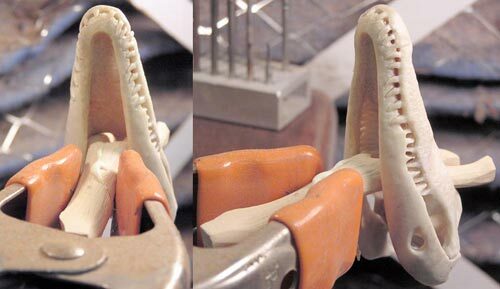 Continuing on with the toothy one – refining the teeth, smoothing and deepening the cuts. Posted Comment: I think the procession of teeth, first small and almost delicate and then larger and overlapping the lower jawline creates a very pleasing effect. At this stage it has an almost abstract quality. I imagine the finished skull will exhibit many such qualities. 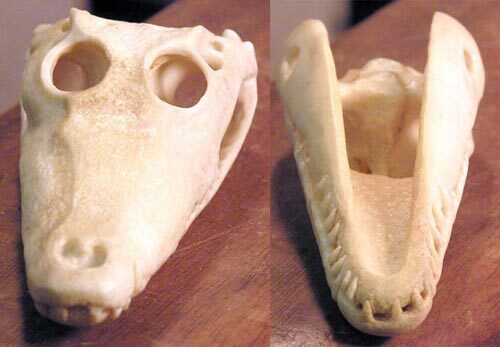 Will you be staining it to create contrast between the teeth and the rest of the skull? 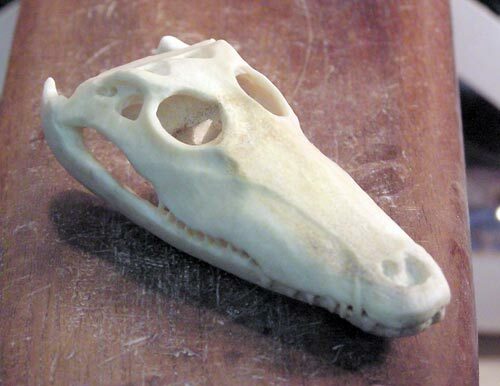 Similar to the way you treated the bird skull you showed us a while ago. Answer: I can’t really take credit for the teeth, that’s the way they actually are in the full size beast. I’ll be leaving the whole thing fairly white, although I’ll be very finely undercutting the overlapping teeth to make little shadows that will help them be visualized. 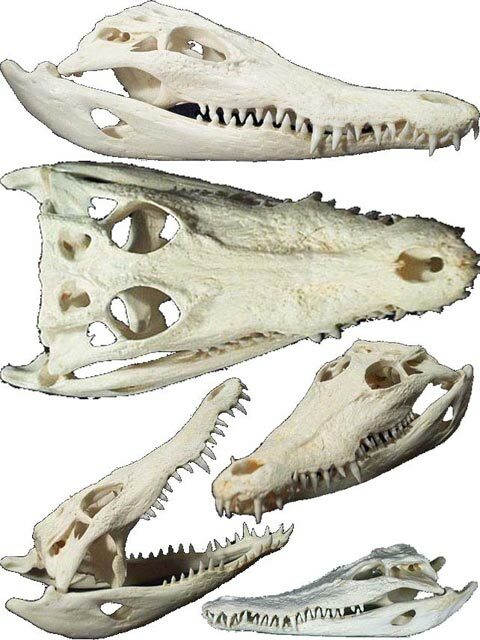 These skulls are just strange looking (as in abstractly cool!). 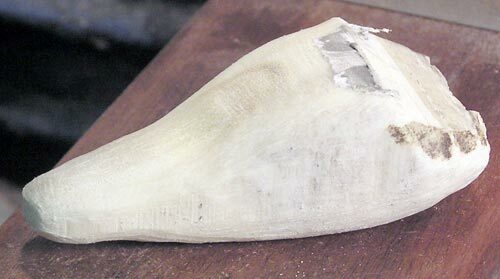 Teeth are defined, and the jaw hinge has been carved. Also hollowed out the skull quite a bit. Supposedly there’s a brain in there, but when you look closely at a real skull, there’s not very much room! Maybe that’s why we don’t keep these as pets and teach them to play fetch the ball. The next tasks will be to undercut the large teeth and create a tiny shadow along each one, then texturing the skull surface. Here’s the mostly finished skull. I’ve textured the surfaces that needed it using a small diamond ball burr. Also I’ve cut in the very fine lines around the teeth for visualization shadows, using tiny burrs and altered dental tool scrapers. Now that the skull is carved, I submerge it in the finish of choice in my “home stabilization” setup, many thanks to Don Fogg for putting me onto this method (usually used for knife handles). 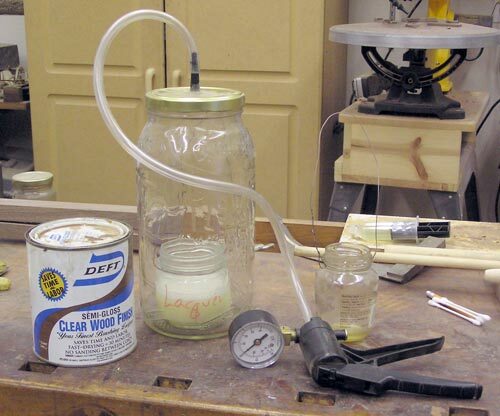 It’s a vacuum chamber made from a large jar, and the vacuum source is an inexpensive automotive brake line bleeding setup from the car parts store. The vacuum pump came with several styles of connectors and I simply epoxied the one I liked best into the lid of the jar, using lots of epoxy to make sure it sealed well. I use several smaller jars inside the vacuum chamber to hold the finish liquids, and have a loop of wire around their rims so I can get them in and out of the vacuum chamber without making a large mess. You can see the jar I reserve for linseed oil sitting on the bench behind the vacuum pump. 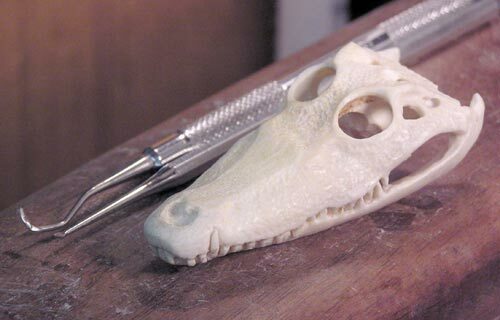 The one I use for nitrocellulose lacquer is in the vacuum chamber and the croc is in the lacquer. 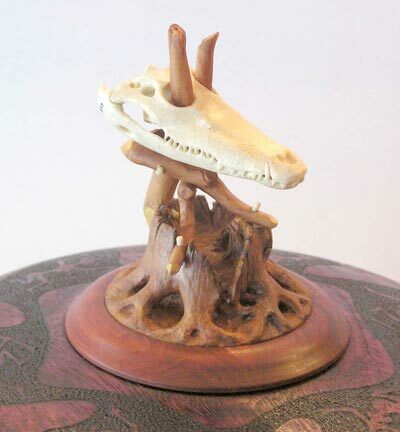 I want to keep the antler pretty white like a real skull, and linseed oil would give it a kind of translucent tan color, so I’m going with the lacquer in this case. To use, I submerge the carving in whatever finish liquid I’m going to use, put the smaller jar into the vacuum chamber and evacuate the air down to about 20 inches of vacuum (a lot of pumping…). 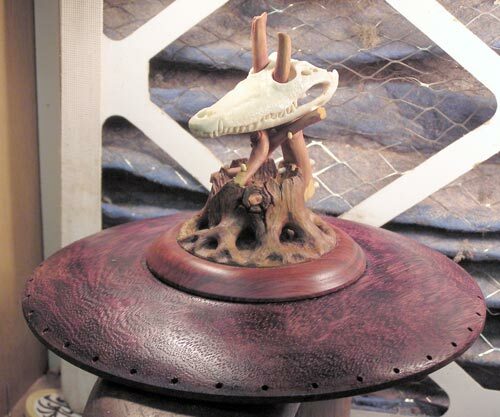 There will be bubbles coming from the carving as the air bubbles leave the wood or antler. I’ll let the carving sit in the vacuum for a number of hours. I typically will let it sit overnight, so about 12 hours in the vacuum. 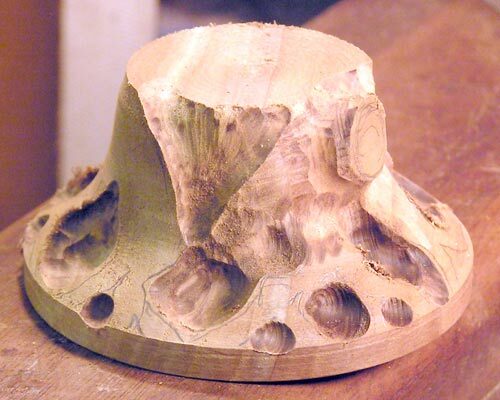 Then I’ll bleed the vacuum off and let the carving sit for a further 12 or 24 hours. This last part is the real secret. Under vacuum, the liquid isn’t going into the carving any faster than if the carving was just soaking under ambient room atmospheric pressure (the pressure inside the carving is equal to the pressure outside), perhaps less since the air is coming out. 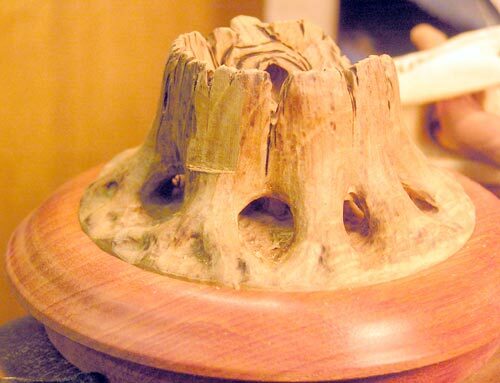 Once the air is removed, and the vacuum released, the carving (as long as it’s submerged) will have a positive 14+ inches of pressure (depending on the day’s barometer reading) forcing the liquid into the wood or antler. I postulate that additional pressure will make it work even better, and am exploring options to add pressure from my air compressor (at about 90psi) but haven’t tried it yet. Don’t want the jar I’m using to explode – would definitely make a huge mess, and might injure someone (or me!). Plus all that flammable stuff everywhere. 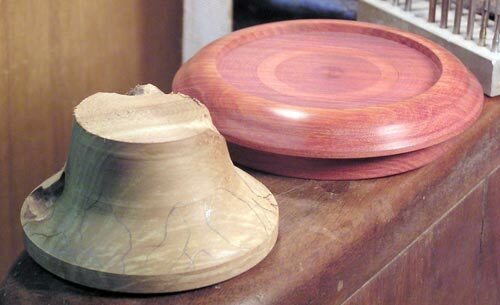 Starting on the next step – a base and basket lid rim, both turned on the lathe. 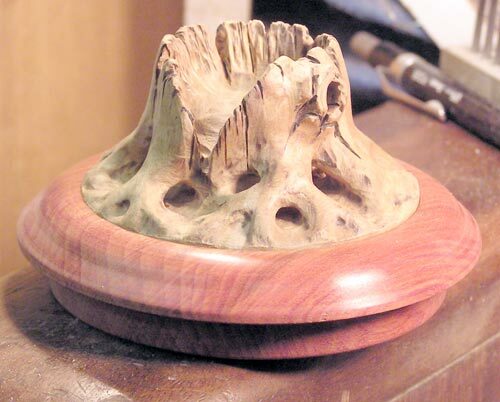 The brown wood is apple, and the redish wood is bloodwood. Beginning to carve in the roots of a weathered stump. Further refining, texturing and a little burning. 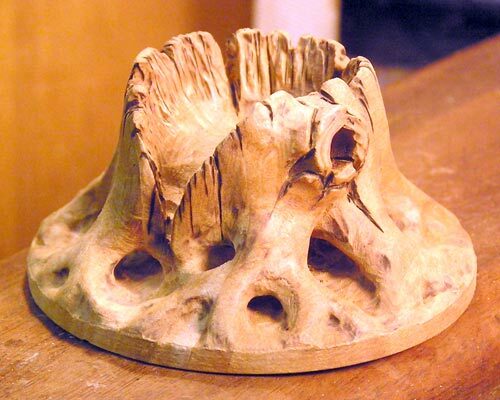 Making a tree branch to mount the skull with (boxwood). I carved the fork to fit the eyes, then with a fine sawblade, I cut one branch off so I could get it through the eye sockets. 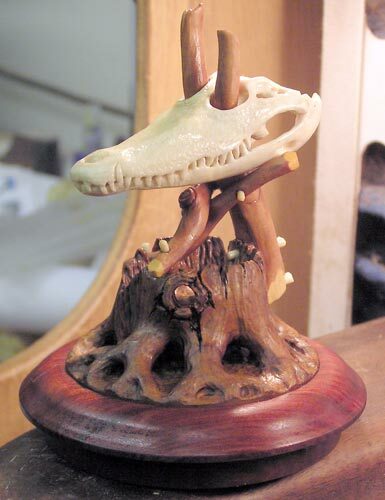 The intent here is for the skull to be free to move, but be held captive on the branch (can’t be removed). 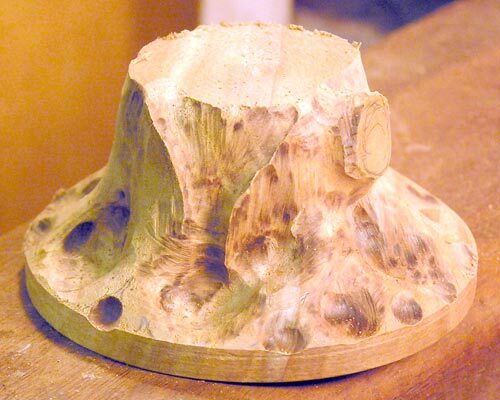 Here’s an image of it assembled and being glued (standard carpenter’s glue – I’m not concerned with the squeeze out since there’s more carving to be done once it’s dry). Now it’s time to begin mounting the skull on the stump. 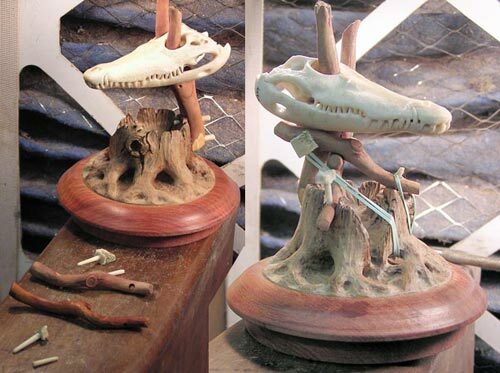 I flattened the bottom of the tree branch holding the skull, and cut a matching notch in the rear side of the stump. Used the carbon paper trick to get the fit just right. 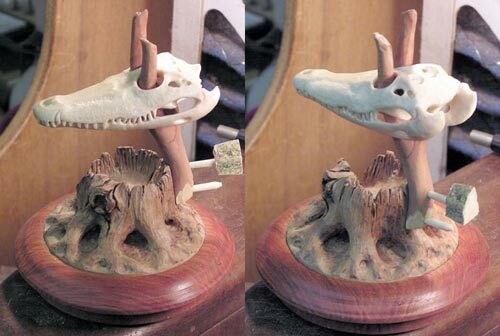 Once the fit was good, glued with epoxy and pegged as well with tiny tapered moose antler pegs. 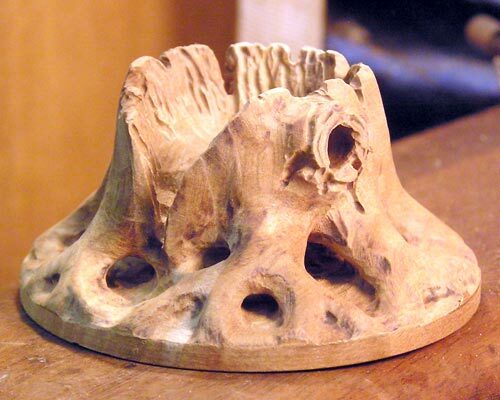 Now that the epoxy for the first branch is cured, it’s time to carve some additional supports (boxwood). You can see the pieces in the first image, and the pinned and rubber banded gluing setup. 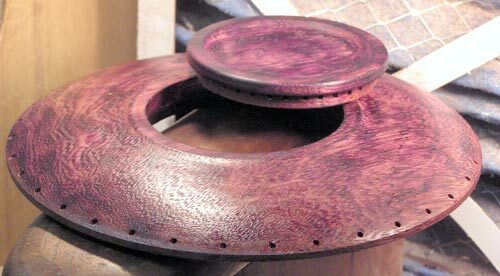 The last photo shows the lid portion with it’s first linseed oil coating. 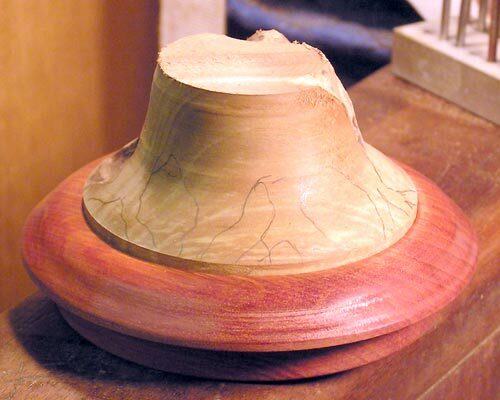 Next is to make the rim and base for the remainder of the basket. 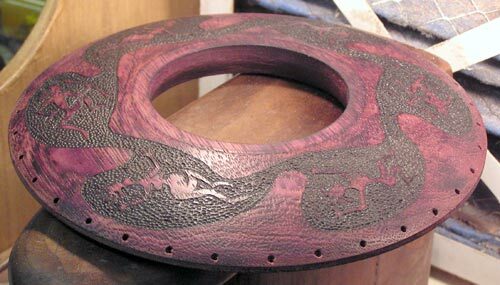 Finished rough turning the basket rim and base today, from purpleheart. 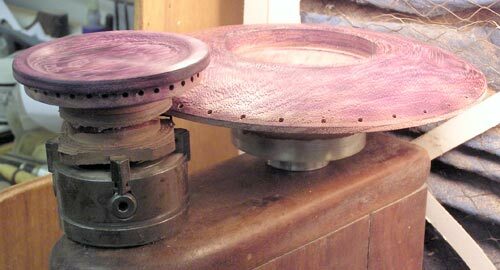 Here they are still on their lathe chucks, with all the necessary holes drilled. 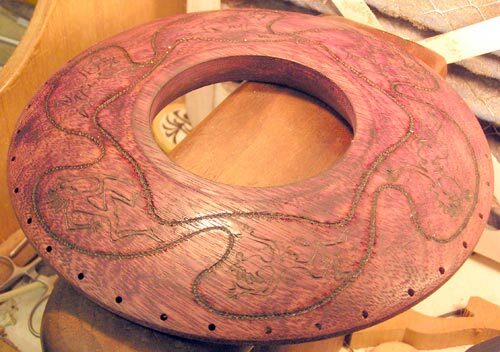 The rim (largest part) is 8 inches (20.3 cm) in diameter. 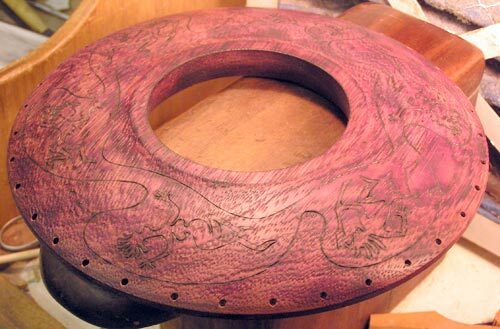 Here are the rim and base separated from the lathe chucks and extra material carved away from the center area of the rim. Had to test fit the lid to get an idea how it will look as well. 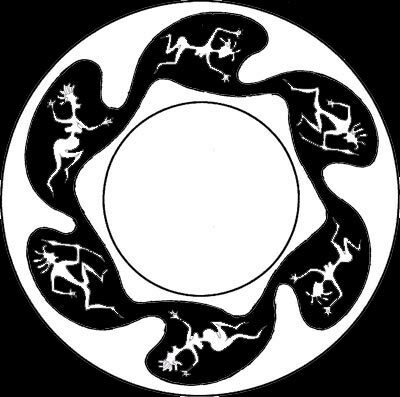 Here’s a small version of the pattern I’ll use to pyrograph dancers on the rim. Here’s the pattern rubber cemented to the wood. 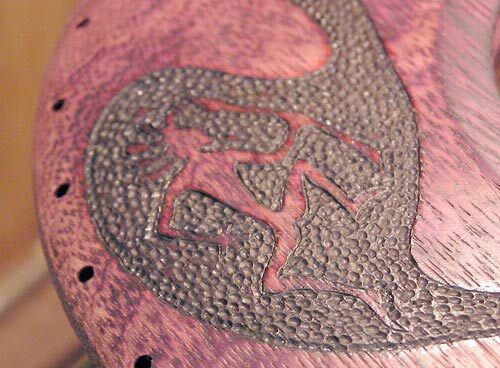 In this image, I’ve used a knife-shaped woodburner tip to burn through the paper pattern into the wood and outline all the lines. Then removed the pattern and rubbed all the rubber nubbin’s off. 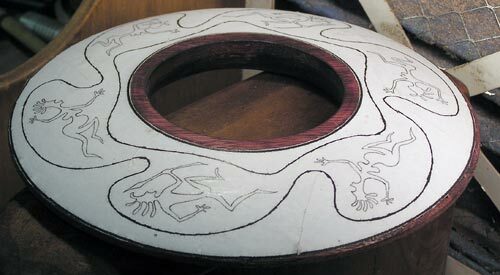 Here I’ve used a woodburner tip like a doubled-over thick wire to begin texturing. I go around all the edges first, trying to burn away only the inside half of the burned “ditch” from the first outline burning of the paper pattern. I’ve only gone around the outside, and haven’t stippled around the dancing figures yet. I’m using a stipple technique by just pressing the very hot tip into the wood repeatedly. Here’s a closeup of the first finished figure. Each of the stipples is an oval, so there is some directionality to the texture. I try to make the stipples flow (like flowing water in a stream) around the figure, and also work in short loops as I go so the stipples don’t get a perceivable regularity in their pattern. On the left side of the dancing figure I can see I need to go back and break up that outside line of stipples. A few more strategically placed stipples will disguise that. I did a quick pass with a lightly abrasive polyester pad in a mandrel in my flexible shaft grinder to get rid of the excess charcoal from the burning. This final image shows the completed burning. Now to paint on a coat of a linseed oil finish, and see if I can coax my better half to sit still long enough to begin the weaving process. A lot of my work lately has focused on “ritual.” I’ve been enjoying checking out talismans, amulets, reliquaries and ritual objects and art, especially Native American and Canadian First Nations stuff, and it’s been showing up in my work. I guess we can call this my “spiritual” phase. Can’t for the life of me figure out what my next phase will be, but it’s interesting looking for it. My wife has begun weaving the basket. 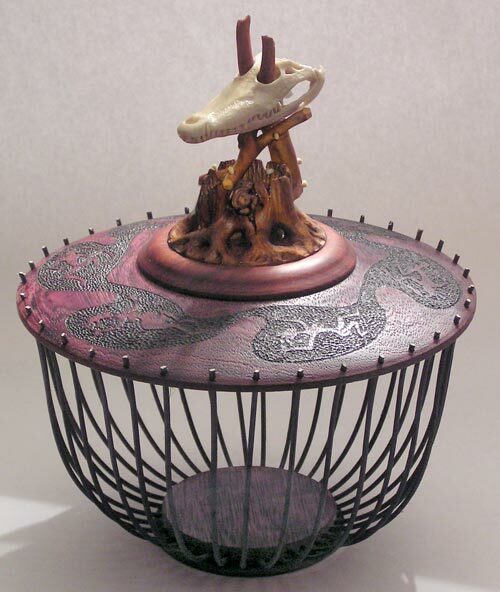 Here it is with the ribs installed – black dyed reed (the inside of the rattan vine). 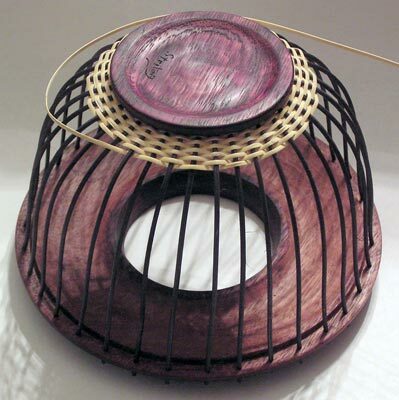 Next, she’ll begin weaving with 2 millimeter carriage cane (has a slick surface, the outside part of the rattan vine). Here she’s begun weaving at the bottom with 2mm carriage cane. This is about an hour’s work – a number of hours more to go, then some fiddly finishing.